Pianist Joseph Kalichstein, violinist Jaime Laredo and cellist Sharon Robinson offer a rare blend of virtuosity, musicianship and joy in collaboration. 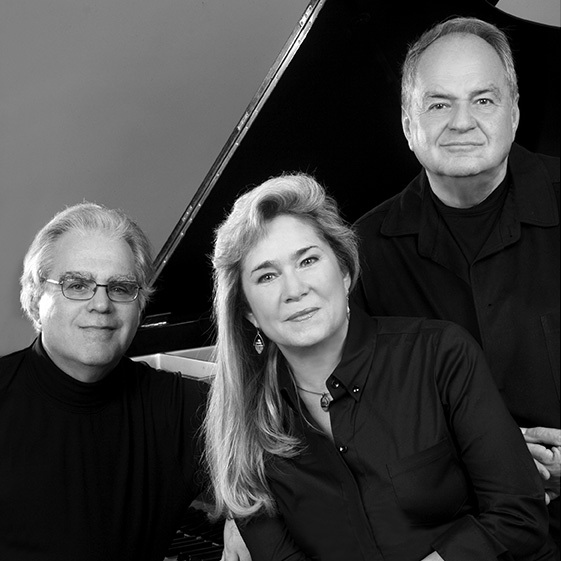 Throughout the three plus decades that the Trio has been actively performing, their continued commitment to bringing new works to life has led them to develop lasting relationships with numerous composers and the presenters with whom they have formed a partnership for creating these new works. The Trio welcomes new commissioning and presenting partners. Please contact Barrie Steinberg, if you'd like information on forthcoming projects. Commissioned by: Regional Arts at the Raymond F. Kravis Center for the Performing Arts (world premiere), Tisch Center for the Arts at the 92nd Street Y, Islip Arts Council made possible by a gift from Lillian and Maurice Barbash, The Abe Fortas Memorial Fund of the John F. Kennedy Center for the Performing Arts, Richard and Judith Hurtig, Chamber Music Society of Detroit made possible by a gift from Norma Jean and Arthur S. Shufro, , Hudson Valley Chamber Music Circle, El Paso-Pro Musica, Arizona Friends of Chamber Music, La Jolla Music Society; through the International Arts Foundation, Inc. Commissioned by: The Virginia Arts Festival (world premiere), The Honest Brook Music Festival (NY), The University of Vermont Lane Series Jane P. Ambrose Commissioning Fund, Raleigh Chamber Music Guild (NC), Schubert Club (MN), String Theory with a gift from Sherry Keller Brown in memory of Dorothy Barckman Keller (TN), Linton Chamber Music Series and Steven Monder (OH), New Orleans Friends of Music (LA); through the International Arts Foundation, Inc.
Daron Aric Hagen "Masquerade for Violin, Cello & Orchestra"
David Ludwig "Concerto for Violin, Cello & Orchestra"
World Premiere Springfield(MA) Symphony with Robert Gutter. Commissioned by: The La Jolla Music Society (world premiere), Chamber Music Society of Detroit (made possible by a gift from Cecilia Benner); Carnegie Hall Corporation; Emilio Gravagno; Linton Chamber Music Series (made possible with a gift from Ann and Harry Santen); The John F. Kennedy Center Abe Fortas Memorial Fund; Arizona Friends of Chamber Music (made possible with a gift from Jean-Paul Bierny and Chris Tanz); Philharmonic Society of Orange County; Seven Days of Opening Nights/Florida State University; Regional Arts at the Raymond F. Kravis Center for the Performing Arts; and Hudson Valley Chamber Music Circle; through the International Arts Foundation, Inc. Commissioned by: The 92nd Street Y (world premiere); The Abe Fortas Chamber Music Concerts of the John F. Kennedy Center for the Performing Arts, Kent/Blossom Music, Chamber Music Society of Detroit made possible by a gift from Geraldine Schwartz, Regional Arts at the Raymond F. Kravis Center for the Performing Arts, Philharmonic Society of Orange County, Ruth Eckerd Hall, Denver Friends of Chamber Music, Friends of Chamber Music, Portland OR, Virginia Festival of the Arts, Duke Performances, Hudson Valley Chamber Music Circle; through the International Arts Foundation, Inc.